These banner rails give a minimal appearance to poster and print hanging. Each sign gripper clips to just the top and bottom of your graphic. Are these banner rails available in custom sizes? For large quantity orders, custom sign holders can be built. These banner rails come in a wide variety of the most popular sizes suitable for all poster hanging needs. In addition, there are suction cup kits offered for hanging these units from a glass door or window. The patented gripper of these banner rails is designed to hold onto the thinnest paper, to the sturdiest poster material, including slippery poly film. Two signs can be hung back to back to allow for double-sided advertisements. These banner rails, which are great poster hangers, offer the retailer many advertising possibilities. 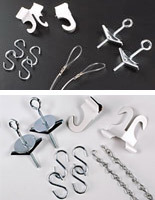 Use these sign holders to hang graphics from the ceiling, on a wall or in a window. The banner rails offered above are lightweight but can easily hold many times their own weight. The weight restriction is more so based on the type of mounting surface rather than these poster grippers. This website also sells hanging display kits that include hardware for banners. These kits include all of the necessary merchandise to successfully mount signage from a wall, or ceiling. In order to mount these banner rails to a wall, all that is needed are a couple of nails or screws. The included plastic eyelets for the top portion, are adjustable, and can be slide from side to side. Fast food chain restaurants and discount stores like to use these banner rails to hang signs in the storefront windows to announce sales events or weekly specials. Purchase one of the hardware kits on this site and these units can then be used to hang signage from the overhead. The versatility of these banner rails is incredible. There is also a poster holder that can be used on a slatwall fixture. These banner rails feature a small plastic lip that is bonded to the back of the extrusion to allow for mounting on a slat board. Use these slatwall sign displays to add some exciting graphics to a typically boring display. 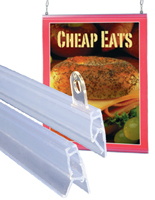 The banner rail featured here comes with a top and bottom extrusion. The top portion has the plastic eyelets, while the bottom section acts as a weight to keep the displayed sign taut. This banner rail is the ideal solution to hanging posters from the overhead. With some hooks and nylon rope, these poster hanging kits are the answer to keeping cluttering advertisements off of the walls. Hanging this banner rail is a snap. Use suction cups with hooks, (not included) to latch onto the plastic eyelets, and mount this sign hanger to a window. Regardless of the need or function; this banner rail will get the job done. This selection of poster holder merchandise is priced for even the strict budget patron. When compared to aluminum or wood frames, these sign grippers are priced hundreds of dollars less, yet accomplish the same task at hand. Can this banner rail be used in tandem with other rails to hang an additional large sign? These plastic poster hanging systems can be used separately or in a row for practically any sized signage. The patented design of this banner rail allows for two units to be able to be butted right up against one another. For further questions regarding these or any of the other sign hanging systems, contact one of the customer service reps.
Can this banner rail be mounted on the outside of a window? Technically speaking these plastic poster hangers can be mounted outside, however an outdoor rated poster material should also be used as there is no protective lens. This banner rail comes with plastic eyelets for hanging but not suction cups. There are supplemental suction cup kits for sign hanging featured on this website. In addition to the wide range of sign holder systems shown above, there is an even bigger selection of POP displays which can be viewed at the online category pages. View the entire selection of supplemental offerings beyond marketing display solutions including, trade show supplies, display cabinets, and other retail displays. This company has been producing and offering quality goods for over four decades now. What started as one man's side job, now employs over a hundred and fifty workers, and occupies three warehouse locations. There are over a million and a half units in these locations at any given time. By maintaining such a sizable live inventory; the delay times are kept to a minimum, and so is pricing. Many of the prices offered are far less than any competitor. Be sure to browse through the huge assortment of clearance merchandise in the sale category. Various of the merchandise in these categories are over-stocked, discontinued or photography samples that have been markedly priced to sell. Also be sure to view all of the newly added merchandise that are launched on this site daily. Bookmark this site as a personal preferred and check back often for all of the newest additions to the different lines.